It’s the chestnut season, at least here in Quimper. When I walk the dog, I pick up about a pound of chestnuts daily with no effort. But then they tend to sit around a bit while I decide what to do with them. You can roast them on an open fire, of course, Nat King Cole (or Michael Buble) style. Or stuff the turkey with them. Or make them into ice cream. I freeze a few bags of peeled chestnuts for use during the winter. 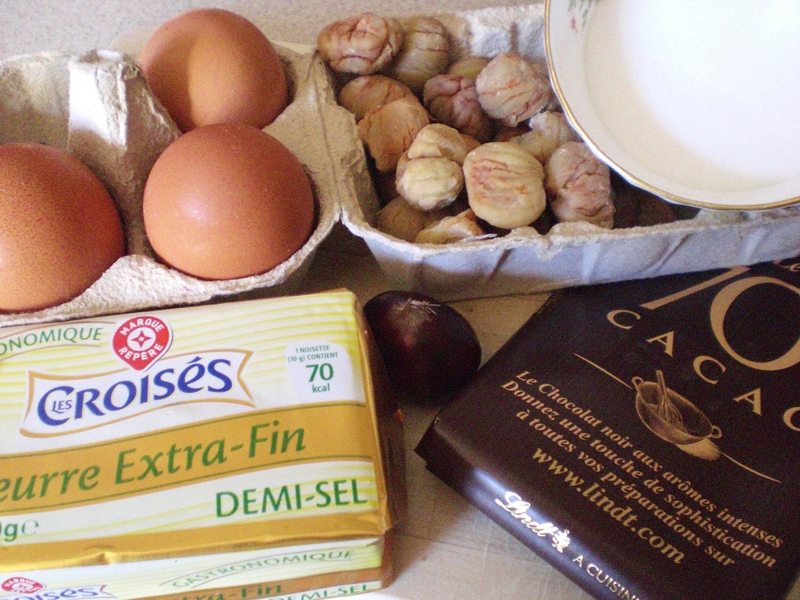 In France, the prime producer of chestnuts is the département de l’Ardèche, https://onefrenchword.files.wordpress.com/2013/10/moelleux-chocolat-ardc3a8che.mp3 which is a region (very vaguely) to the west of Grenoble and to the north of Montélimar (to the top left of the bottom eastern quarter of France, if you see what I mean). Chestnut growing (la castanéiculture) https://onefrenchword.files.wordpress.com/2013/10/moelleux-chocolat-castanc3a9iculture.mp3 is closely linked with the history of the area. Une châtaigne (feminine noun), la châtaigne, les châtaignes = sweet chestnut (a horse chestnut is un marron). Horse chestnuts are not edible, but strangely, when a sweet chestnut has been cooked, it becomes un marron, as in marrons glacées (sugar soaked Christmas confectionary), la dinde aux marrons (turkey stuffed with chestnuts), de la crème de marrons (a sort of sticky jam/spread made of chestnuts with loads of sugar, that is eaten as a dessert in France mixed with fresh cream). Sometime last year, I explained that a circumflex (^^) often denotes an s that has been lost somewhere. Châtaigne is a case in point: castagna in Spanish, and the Spanish instrument castagnettes (little chestnuts). The English word chestnut retains the s. The chestnut tree is un châtaignier, which comes from the Latin castanea and the Greek kastanon. Chestnuts are crammed by twos or threes into a prickly shell which in French is called une bogue. Because of them, dog walking in the chestnut season is, for the dog, a very painful, hoppy skippy process. Une châtaigne can also mean a black eye. 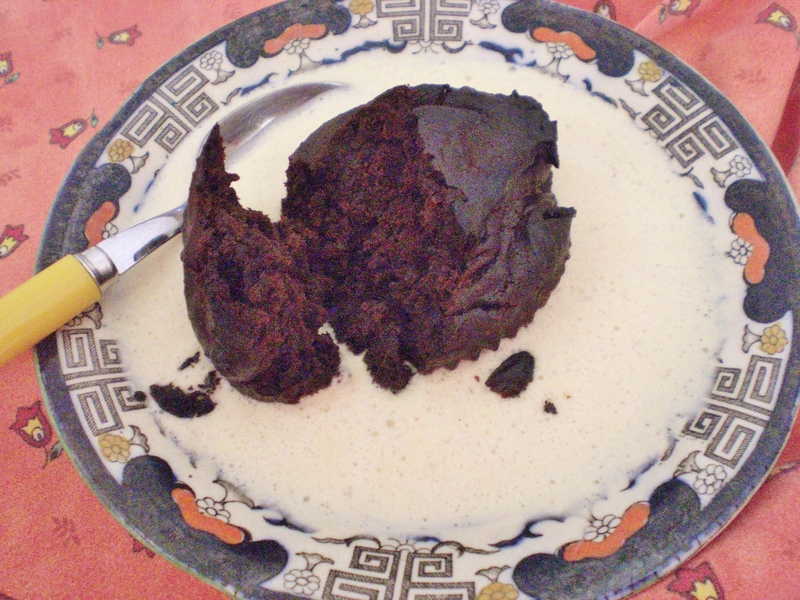 “Etre châtaigne sous bogue” https://onefrenchword.files.wordpress.com/2013/10/moelleux-chocolat-chc3a2taigne-sous-bogue.mp3 means to be basically nice under a very prickly exterior. Tirer les marrons du feu https://onefrenchword.files.wordpress.com/2013/10/moelleux-chocolat-tirer-marrons.mp3 (literally to get the chestnuts out of the fire) means to obtain something with difficulty, with effort, and for someone else’s benefit. Etre marron means to have been tricked, or to have fallen into a trap. Make a cross cut with a knife in the top of the chestnuts, pressure cook covered with water for 15 minutes. Leave to cool slightly but in the hot water. Peel the chestnuts being careful to take off both skins and trying to keep them whole (you can really only use whole ones for this recipe). Make a syrup with 500gr sugar and 180gr water. Simmer the chestnuts gently in this syrup for about 15 minutes. Drain. Put into jars and cover with rum. Wait at least a month before eating them. 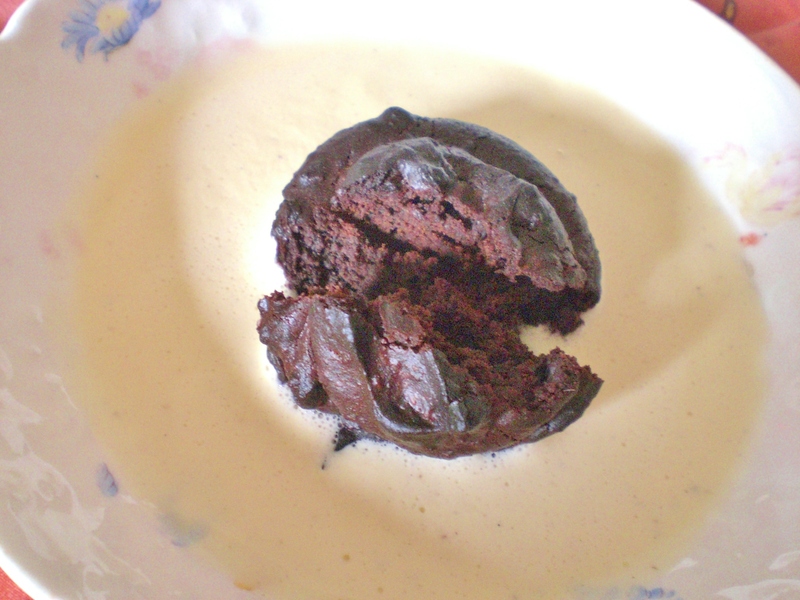 But my recipe today is for petits moelleux au chocolat noir et aux châtaignes. Melt the chocolate over a pan of hot water with 20gr of butter. Add to the chestnuts with the egg yolks, the sugar, the armagnac and the rest of the butter which you have melted (this can be done in the chocolate saucepan, the butter will take up any of the chocolate that has been left in the pan). Beat this mixture together. 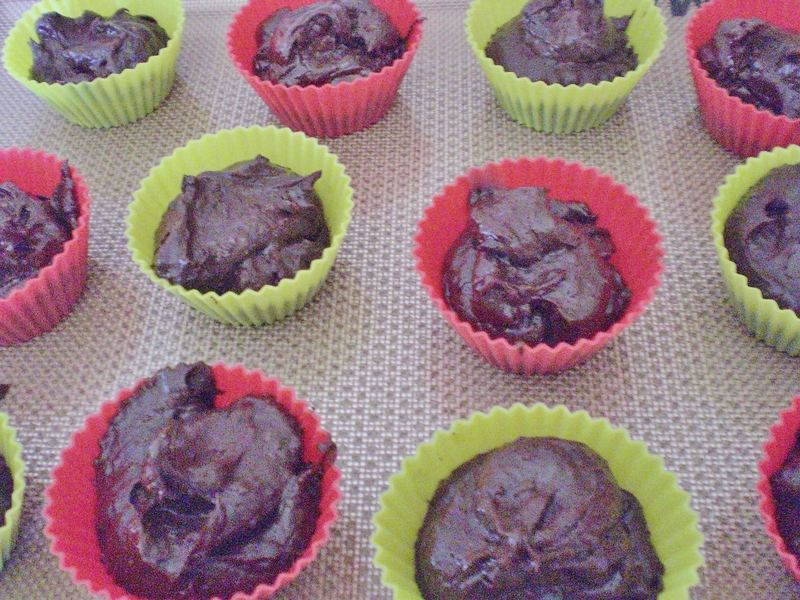 Spoon the mixture into muffin or cupcake molds and pop them into the oven for about 30 minutes. This seems a long time, but that was what it took mine to solidify enough on the outside. They should be very moist, almost liquid in the centre. Serve warm with a custard if you like that. Cold they are fine too. Mine came out of the oven very glossy. They were quite dense, with little crunchy bits of chestnut, but moist in the middle. If you wish them to be lighter, I suggest adding a little raising agent, and maybe saving the egg whites, beating them up firm, and folding them into the mixture at the last minute. I made a frothy custard (not going to tell you how to do that, I use my Thermomix which takes all the pain out of the process), and placed my little cake in the centre of a tasty yellow pool. Posted in Cakes and desserts, Feminine Nouns, French recipes, Nouns, Vegetarian and tagged châtaigne, chestnut, chocolat, Chocolate, Cook, France, French food, French language, French phrases, French pronunciation, French recipes, French words, learn French, marron, Marron glacé, moelleux, pronounce. Bookmark the permalink. 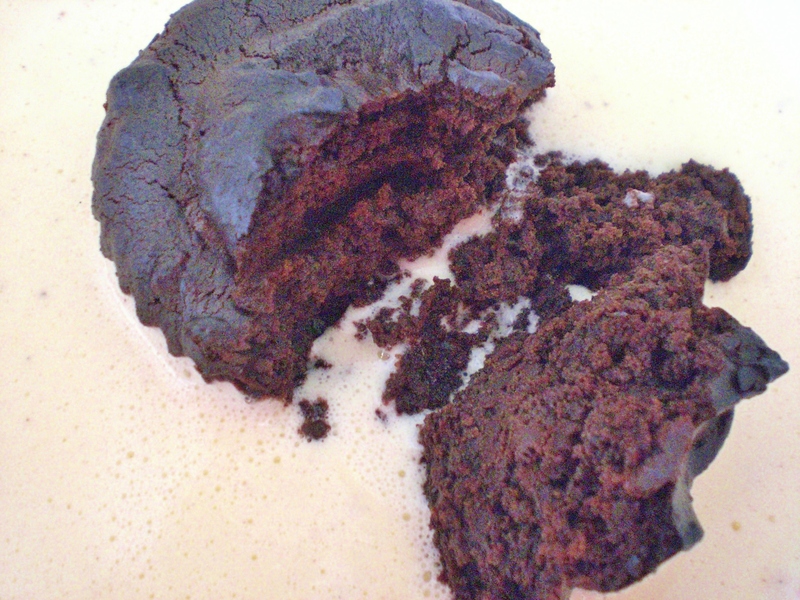 This recipe is for all my chocolate loving friends, and is heavenly! Thank you One French Word.